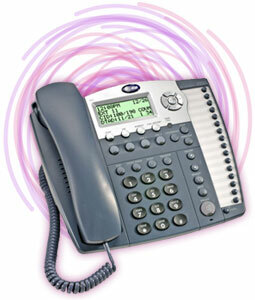 A corded phone is a phone that has a handset connected to the phone’s base station by a cord. The cord stays out of your way while the phone is on the base, though once you pick up the phone, the cord easily extends. If you run any kind of small business, or especially an office, a corded phone is preferential because of the ease and convenience of use. If you have a corded phone, you will never have to worry about where the phone may be when you have to make a call. Unlike cordless phones which are prone to getting lost, especially in an office environment, the cord on the phone will guarantee that the phone will not be going anywhere. Corded phones are convenient in almost all working environments, as the individuals that use the phone will most likely be nearby the phone anyway and not have to roam far away from the phone's base. It is even useful to have at least one corded phone in your home, as this will supply you with a phone that is always readily available. An additional benefit to corded phones over cordless phones is that they will always have power, even in a power outage. Corded phones are powered by a small amount of electricity that is supplied through the phone line and not by the building's regular power supply, making it one of the few things that you can always rely on in a power outage. Cordless phones run off of rechargeable battery power, and if your phone is not put in the base station for a period of time, the battery will die and you will be left to wait until the phone recharges to be able to make a call. The life of cordless phone batteries will also reduce as time goes on, especially if it is constantly left being charged in the base station, so the phone's usefulness will actually degrade over time. This will never be a concern with corded phones, as they are constantly supplied a small amount of electricity. There is a great variety of high-tech corded phones available right now, and they are available for far more affordable prices than cordless phones that supply the same features. On TWAcomm.com, you will find many different types of corded phones, all with unique features to fit your needs. Many corded phones, such as the ClearSounds Ultra Clear Amplifying Speakerphone, allow you to amplify the volume of calls while increasing the sound clarity, making it perfect for a loud environment or for those that are hard of hearing.